New Project for Learning about The World! Time has gotten away from me. I have no other excuse for not keeping up with the blog. Summers are busy days for playing with my boys. Sometimes, instead of me wearing them out, they wear me out so much, that their nap time becomes mine as well. I can’t complain about that. I do love my naps and that I am able to spend my days at home with them. I know I am lucky. Things do tend to get in the way of my working on my various projects, though. I will attempt to do better. I think I have found the perfect way to do so. One of my fellow Multicultural Kid Blogs Contributors from Kid World Citizen has created the coolest Diversity Calendar out there (in my opinion) and I can’t wait to start celebrating some holidays that are new to me, but important around the world. Here is the description from their website. •fun holidays that celebrate friendship, empathy, and kindness. Even though it is probably intended more for teachers and homeschoolers, I know that my boys and I can come up with some fun things to do with it. From World Friendship Day to International Talk Like A Pirate Day and so many animal appreciation days, I think this will be a fun project! I’m excited to show them how beautiful the world is in all of it’s celebrations. Want to do it with me? I’d love to find ideas on how to celebrate some of these with you! If you would like to purchase your own calendar you can do so HERE. Excited to Add New Things to Our Celebrations! 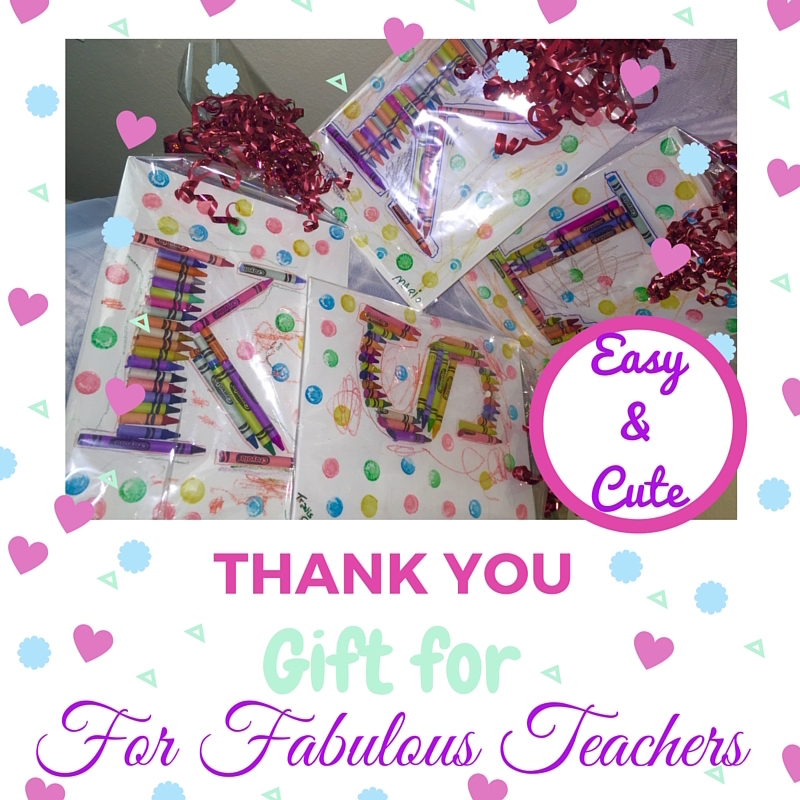 Easy and Cute Teacher Gift! Because 3 of the things used are standards in my craft room, we spent a little over $1.50 per gift. Not bad for a days work! 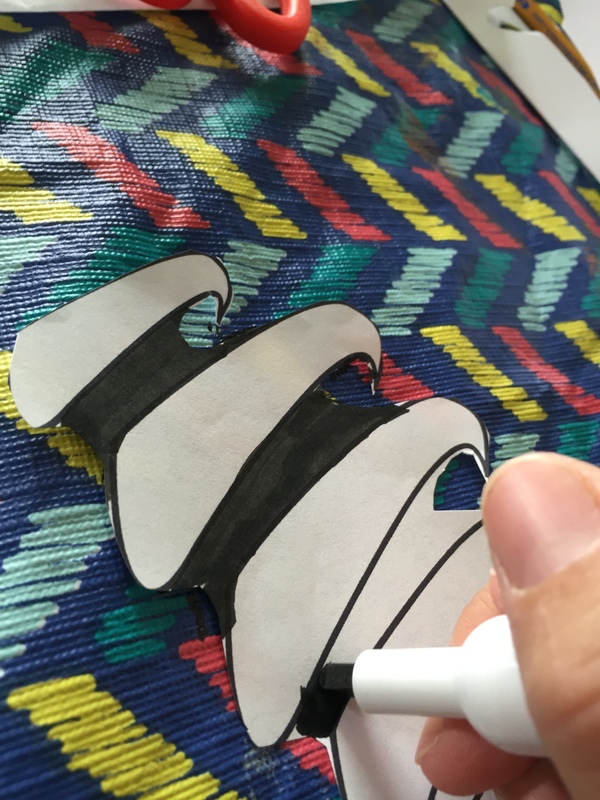 First print or draw the letter you want to use as a guide for your product on a sheet of paper. Copy that same letter onto your canvas. I cut the printed letter and used it as a stencil so they matched. 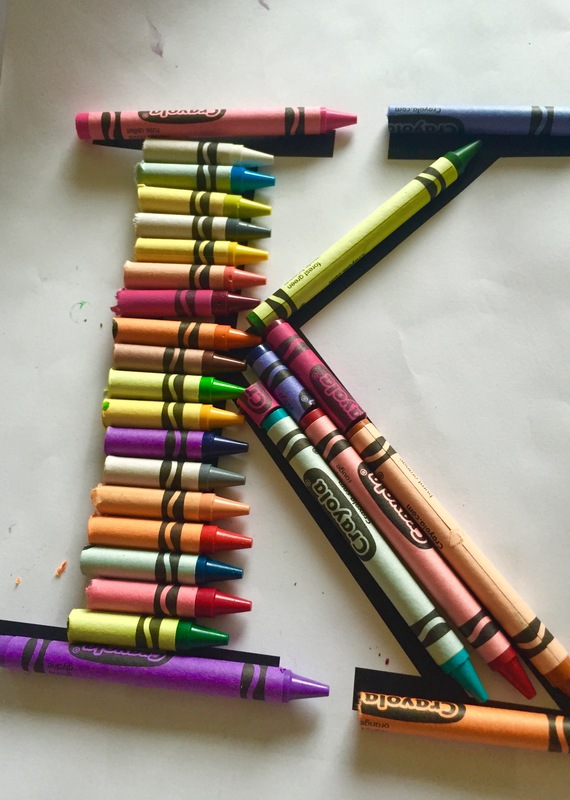 Second start arranging your crayons to fit the letter and cut them to size. I just used a sharp knife, but you can use a small electric saw if you have one and are comfortable using one. I am not, so I stuck to what I felt comfortable with. 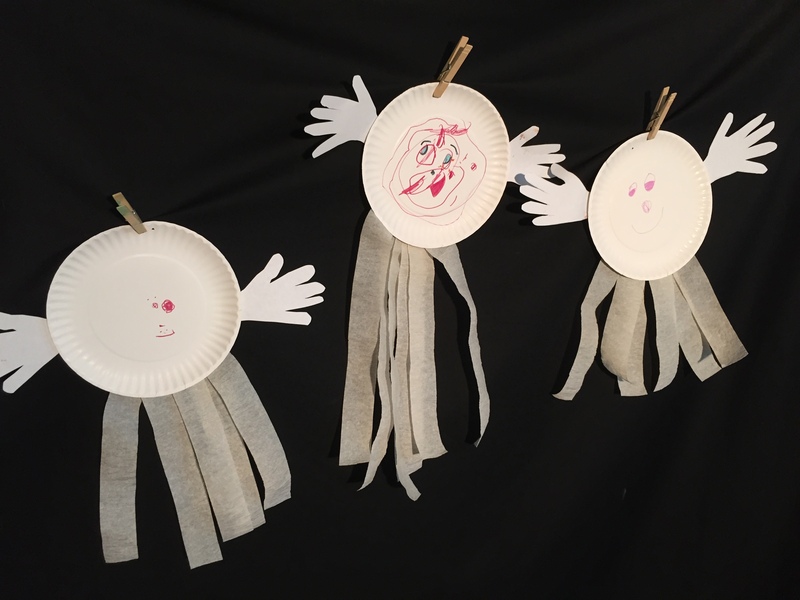 Once you know how you want them, start transferring them over from your sheet to your canvas and gluing them with your glue gun. I recommend doing one at a time. I tried to make a line and quickly setting more than one to go faster, but the glue dried before I could get them over. Oops! One at a time works better for me. Because I had to to them this way, I didn’t let the boys use the glue gun this time around. Way to easy to burn your fingers when you are holding the crayon. Not much room for error, ask my fingers. Once they were dry, I gave the leftover crayons to the boys and they went to town on the canvas. Here is where our Spanish Lesson came in. We reviewed our alphabet and then named the letters we needed. We reviewed our colors as they picked their crayons and named the ones that were glued. They also got to count the amount of crayons used. Learn & Play, I say! They loved the idea of drawing with crayons around crayons for their favorite teachers. Sweet Boys! For the finishing touch, we used the dot paint to make the pictures pop. Once everything was set, I glued a piece of the rope to the top for hanging. Wrapped them up and Ta-Da! Pretty gifts! You could do everything in a day (though the cutting was the must time consuming task so be prepared for that). Hope you like it! Happy Teacher Appreciation Day to all of the Fabulous Teachers out there Past and Present! Life gets crazy sometimes and there is really nothing we can do about it but try to keep up. The saving grace for me is the time I get to spend with my littles. There is just no other feeling like that love you feel when it is just you and your kids, cuddling, chatting and giggling. One of my favorite times is night time or as we call it “nite-nite time”. I get to cuddle with my little ones individually, read stories, sing songs and TICKLE! I love their giggles and just having that special bonding time with each of them. It fills my heart. I have sang the same Spanish songs to both boys since they were born. My mother gave me a CD from Grupo Truhui when my first was born and it was like magic. It truly did help him calm down and fall asleep. Not only that, but it worked with my second, too! Because of that, I learned some of the songs and created a mashup version that I now sing to them every night. The other night, my oldest was playing with the camera on my phone while we were getting ready for bed and decided to make a video of our songs. I wanted to share it with you because it means so much to me and I will cherish this video and our memories always. Sorry for the bad lighting (night time) no makeup look, goofy faces and the not-so-perfect singing from me (I do not claim to be a good singer). But M IS in my opinion, so concentrate on him. He just makes me smile! I hope to one day make a singing video with my little one as well. When I do, maybe I will share it, too! Thank you for reading and may all your nights be filled with song! 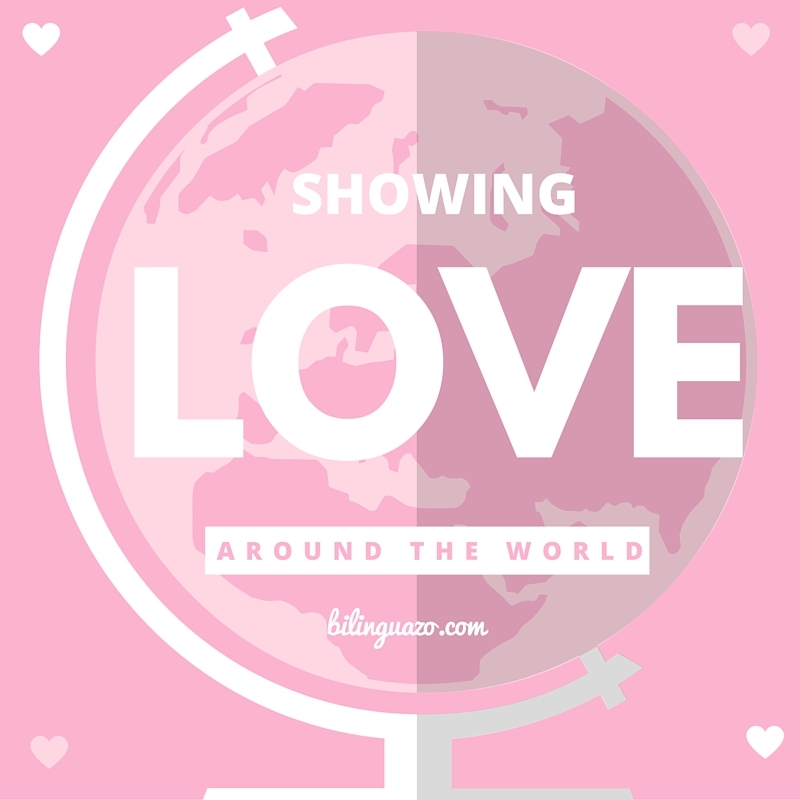 Showing Love And Affection Around The World! Hello World! Hope you are having a LOVELY day! This month, I am the host of the blogging carnival for Multicultural Kid Blogs and I couldn’t be happier. Although I am not one to celebrate Valentine’s day, as it turns out I AM a bit of a sucker for love. That means this month’s theme is quite fitting. In this post I will share with you how my fellow multicultural bloggers and I do just that as well as where you can find them. You will read posts about how people greet each other where they are, how parents show love to their kids, how extended multicultural families show their love, how families kiss, greet each other and much more. So let’s get started. First, let’s learn how to say I Love You around the world! Check out it out HERE! Kissing is a common way of showing love all over the world. But how many kisses are expected depends on where you live. The Piri Piri Lexicon wrote this funny post about kisses in France. Bisous? 1, 2, 3, 4? French greetings: how many kisses? Here is a hillarious one also about kissing from Sarah at A Life with Subtitles An American Girl’s Guide To Kissing How many awkward kisses have you experienced? I also wrote this one for MKB last year on Valentine’s Day Around The World with some great ideas (also thanks to many of my MKB friends): Please do check it out. I hope you have enjoyed our February Blogging Carnival for Multicultural Kid Blogs! Please follow the group on the MKB site and Facebook page as well as all of our fabulous contributors! We Love to Share the Love All Around Our Beautiful World! Donating Halloween Candy for Veteran’s Day! I may a little late to do things, but this year I was not going to let the chance to donate the kids halloween candy pass us up yet again. 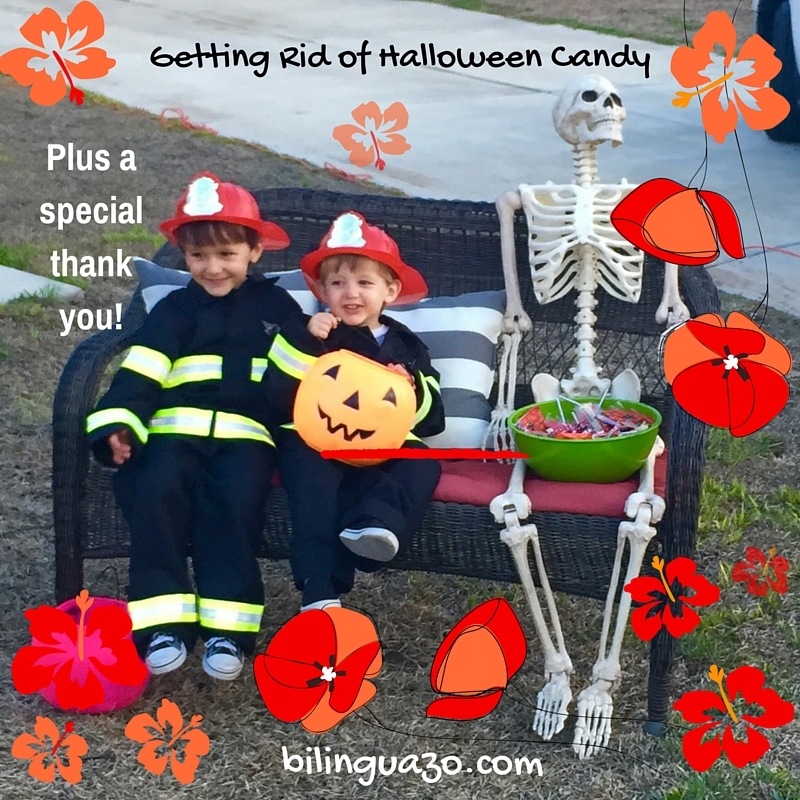 They got a ton a candy, way too much for two little boys. Really, way to tempting to stay in the house with that chocolate junky that takes over my body every time she smells that delicious scent. MMMMMM….wait, were was I? Then it was time to get crafty, of course. 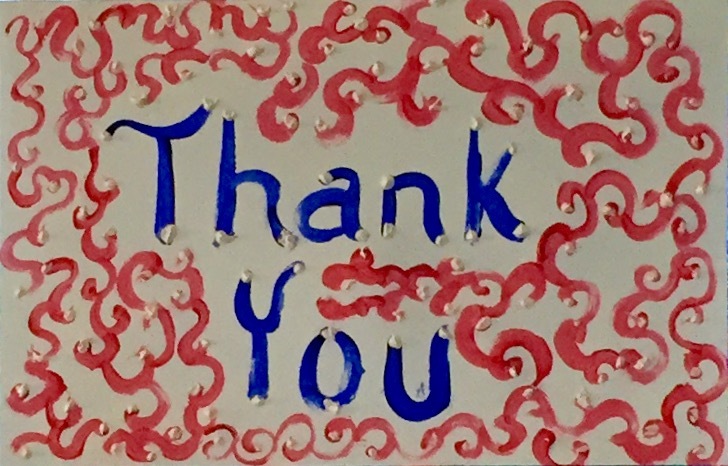 We each made a little thank you card for the troops to add a little extra cheer. T’s is quite artsy, I say. He chose the colors himself it turned out really beautiful. I wish I had a better picture of it. M’s melts my heart. He drew a soldier with a feather on his cap. The little guy in there is himself. He said he was there to cheer him up and that is why they are smiling. The whole picture tells a story. I love it. I’m very proud of my little guys. While reading about Operation Gratitude, we found that you can send all sorts of things year round! Save the information somewhere where you can easily access it and send a little love to those so many take for granted anytime you feel like giving. Click Here to save it. With that, I end this post and say, Happy Veteran’s Day and Thank You to all of the men and women who have served, are serving and will serve for keeping us safe year round! 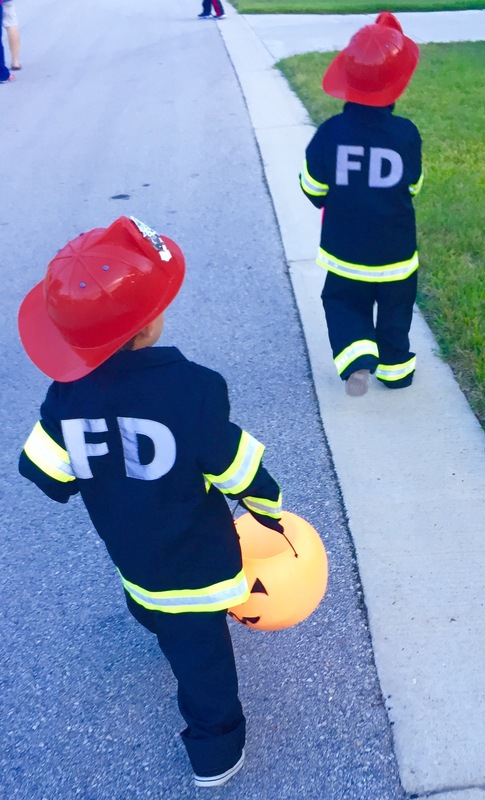 Halloween is almost here and my boys couldn’t be more excited! They have been wearing their costumes since we got them for them and have been busy creating some of their own. 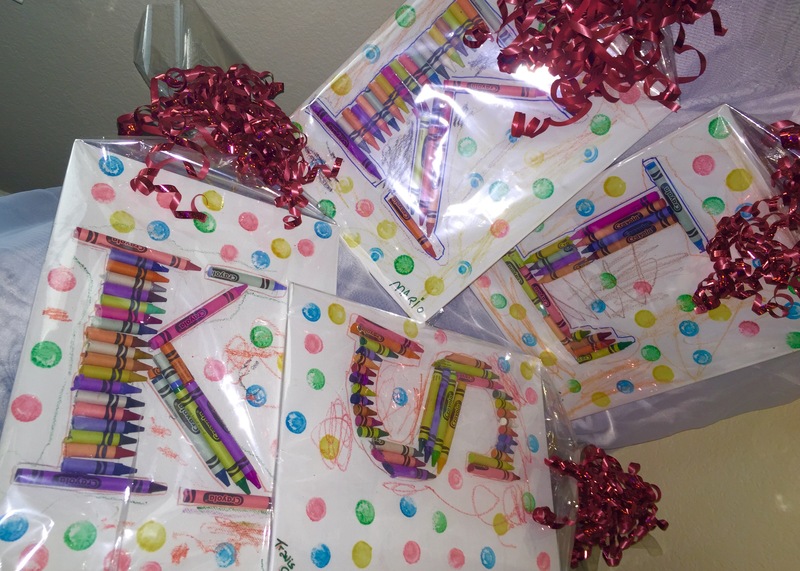 We have also been doing my favorite thing…getting crafty! Yep, you can never have too many crafts! 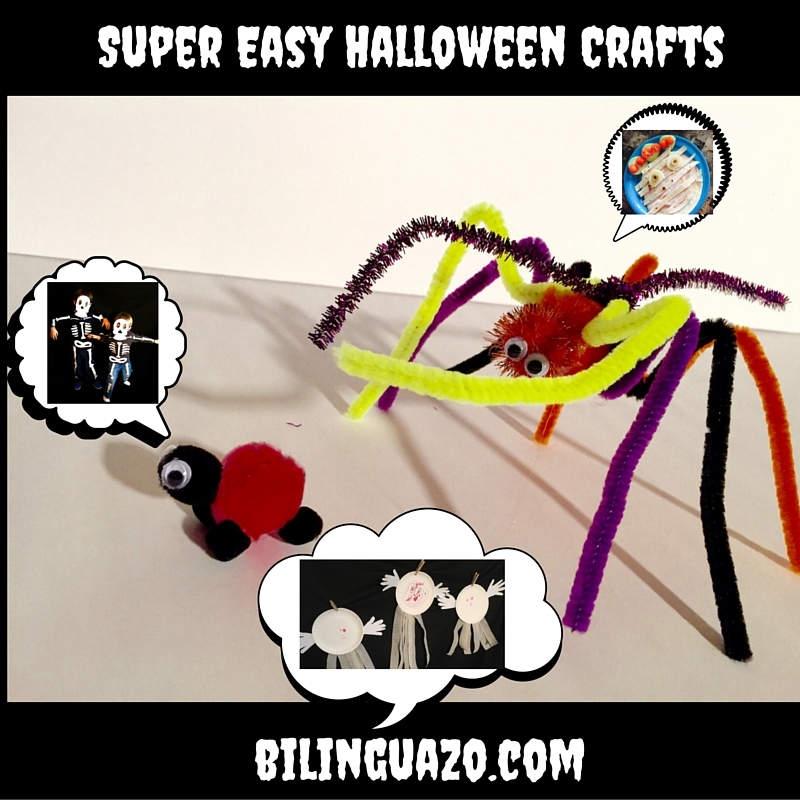 Here a few super simple crafts and ideas for your last minute Halloween fix. 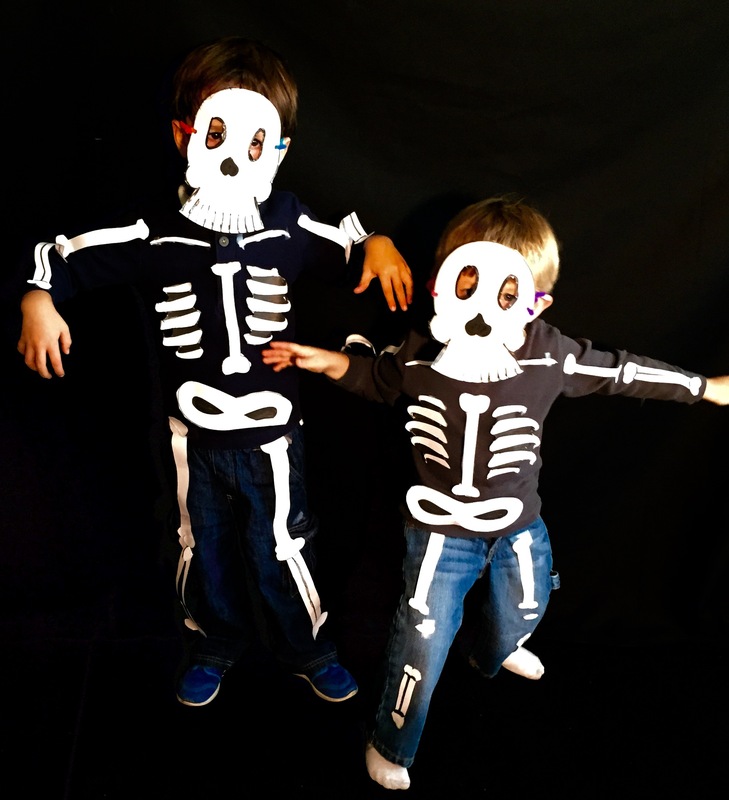 My oldest wanted to be a skeleton one day, so I searched on Pintrest for an easy to make costume and came across a million ideas, of course. 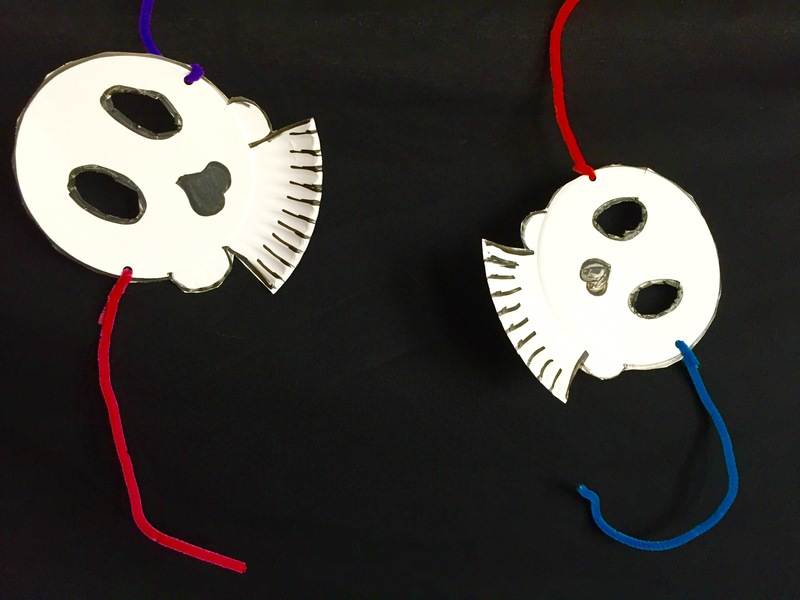 Here are a couple of super easy ideas for the skull and another for the rest of the skeleton. 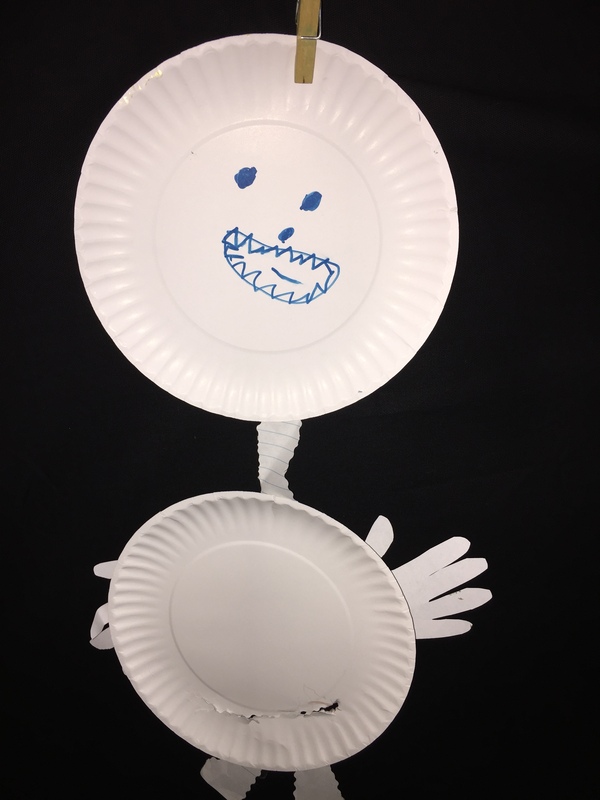 Follow the middle circle on a paper plate with your marker to make a horseshoe shape. Draw circles for eyes and an upside down heart for the nose. 5. Punch holes on both sides and tie a pipe cleaner or string through it. For the body I found a printable template on Poofy Cheeks that was perfect. I just printed two for both of my boys and cut out the shapes. I wasn’t about to cut each individual bone, so I just colored in the blank spaces with a black marker. Perfect for people that want to be a little crafty but don’t have a lot of time. 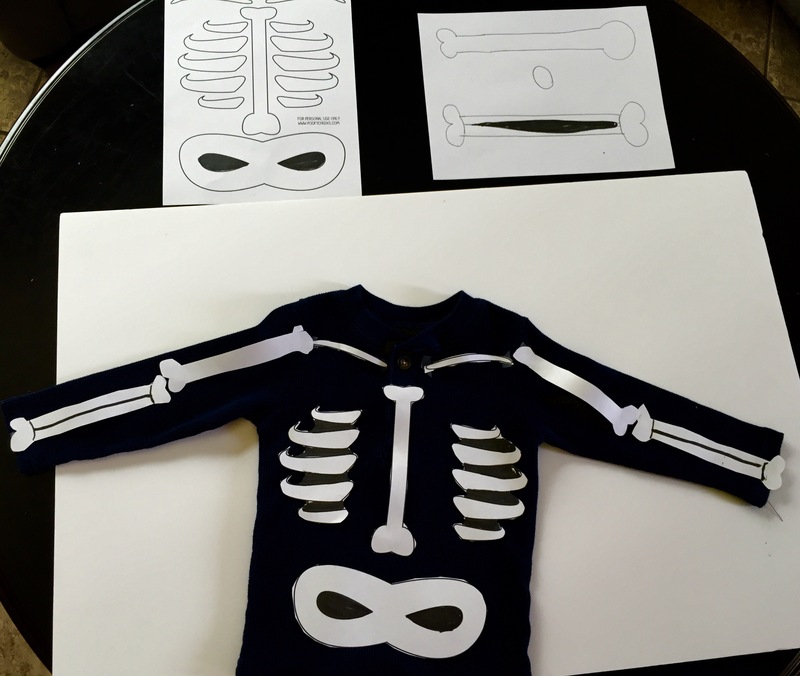 I hand drew the arm and leg bones myself so I could make them the right size for my littles. Finally I taped them to some dark clothing, added the mask and the skeletons were complete! I wanted some spiders to hang on our fake spider web, but I wanted them to be extra special. 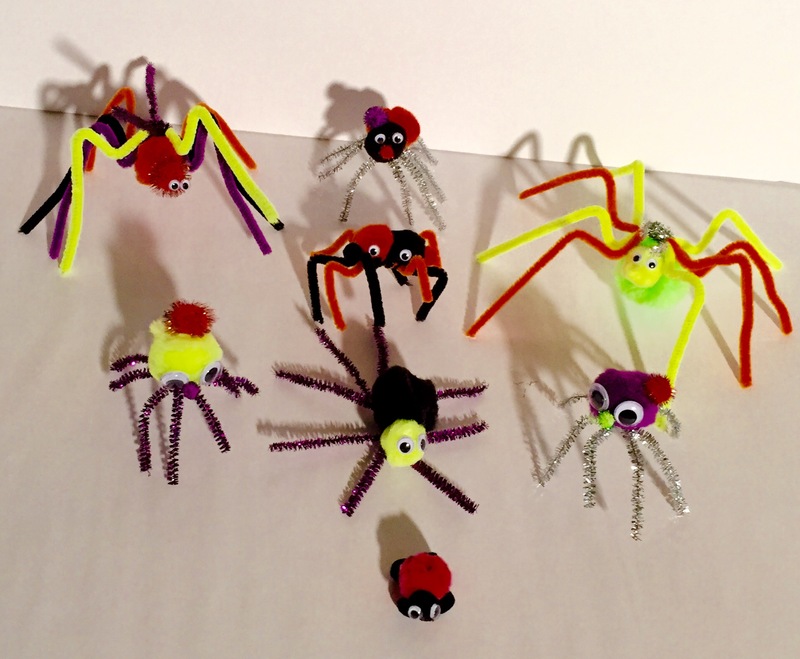 I solicited the help of three very talented artist (aka the fam) and a spider family was born. Cut and shape the piper cleaner to the sizes you want the legs to be. Let your imagination run wild. Glue the legs to the pom poms and add eyes.DONE! This one is fun for little hands, too! Add streamers to the bottom of the plate. Tape to the back of the plate. 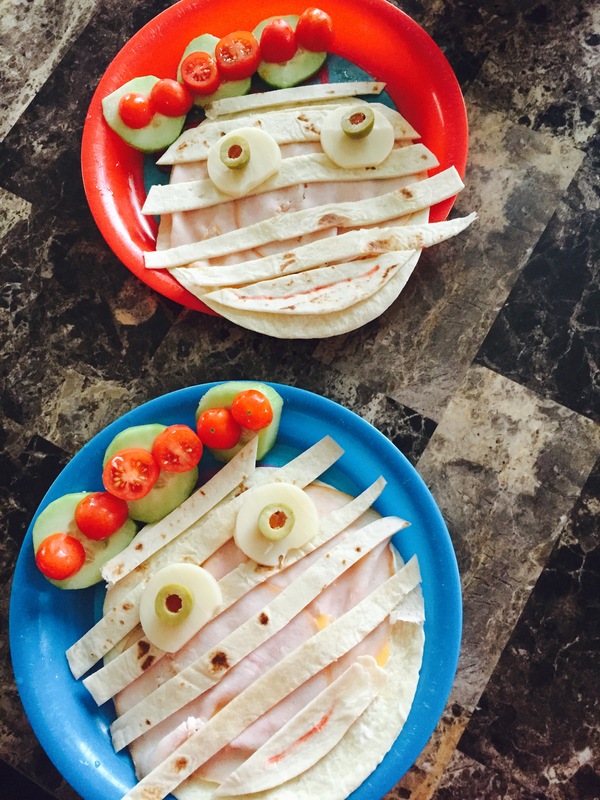 Here are some easy food decorating ideas. Add your filling. We did ham and cheese. Let cheese melt and then remove from heat. Add your strips of tortilla on top leaving enough space to see through and leaving the smallest strip out. Draw a smile on the little strip you didn’t use and add as mouth. Easy peezy! I added tomatoes and cucumbers to the plate just to make it a bit healthier. 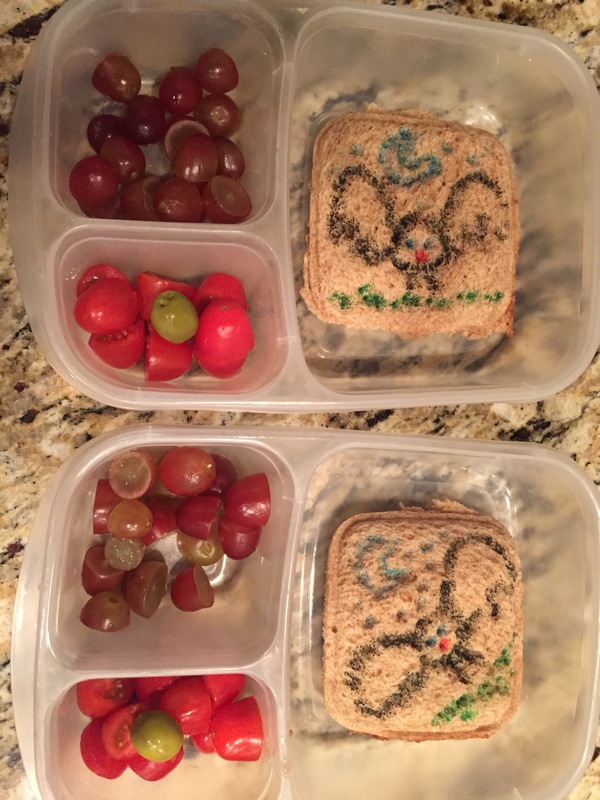 I am that cheesy mom that send decorated sandwiches to school. Although my art skills could you some work, the boys really enjoy them. I’ll keep on doing it until they tell me to stop or I don’t find it fun any more, whichever comes first. Draw to your hearts content. Just remember your canvas is pretty small so don’t try to get to detailed unless you are crazy talented. It’s not easy to show too much on bread. Here are a couple of examples. There you have it. This is how I’ve been keeping busy these days. What crafty things are you up to?